Tanyel Gumushan, a former Music Industries student who achieved a First Class degree from the School of Media in 2017, has received the UK Music Outstanding MAP (Music Academic Partnership) Graduate Award (OMGs) at the Creative and Cultural Skills Awards. Tanyel was nominated for the prestigious accolade by Degree Leader and Senior Lecturer in Music Industries Matt Grimes. He said: “I nominated Tanyel for the award following her work while on the Music Industries course at the School of Media, and more importantly for her work outside the course. She threw herself into the industry, writing for a number of publications such as the NME. Tanyel’s final-year project, ‘Band-On’, focused on improving access for under-18s to live music. She provided a solution to a licencing issue which many venues and local authorities across the UK have struggled with. The judges were impressed with Tanyel’s proactive and dedicated approach to her studies and development of her career outside of university. She is an exciting young professional with boundless energy who has had the talent and vision to pursue her multiple musical passions very successfully. 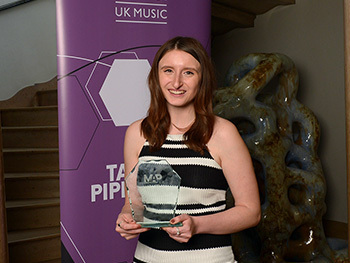 “The Outstanding MAP Graduate Awards seek to highlight the amazing talent coming into the industry as well as the fantastic work being done by UK Music’s Music Academic Partnership members, such as the University’s School of Media. Following her graduation, Tanyel was successful in securing a position as a Live Music Adviser for licensing and royalty body PPL-PRS at their new base in Leicester, offering an opportunity for her to put the skills and knowledge acquired during her time at the University into practice.